Lauren Wesley Wilson launched ColorComm in May 2011 as an invite-only luncheon. It’s normal at any stage of your career to look for examples of success to learn from and possibly emulate. It’s also normal to look for commonalities between yourself and the people in those success stories to use as confirmation that your goals are within reach. But what happens when you’re in a work environment or industry and are having trouble finding people who look like you in the upper ranks? Does it mean that they don’t exist? This was the question Lauren Wesley Wilson asked herself while working for a major PR firm. During her time there she didn’t see any women of color at the VP level or above even though the office had more than 50 employees and a global network of executives to pull from. This observation inspired her to create an invite-only luncheon series to shine a spotlight on high-level women of color in the communications industry while connecting them with other like-minded professional women. As word began to spread about these luncheons, Wilson saw a greater need to expand the series into a more robust organization. Thus, the ColorComm Network was born. Here she talks about ColorComm’s early beginnings, making the transition from an event series to a membership organization and some of the challenges and opportunities that young professional women of color face. Hashtags + Stilettos: How would you describe ColorComm to someone who was hearing about the organization for the first time? 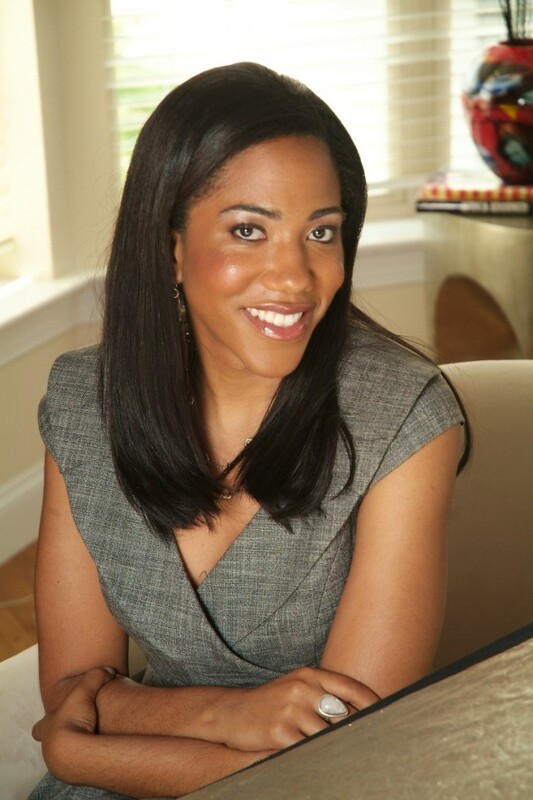 Lauren Wesley Wilson (LWW): ColorComm is a first class membership organization for women of color in communications. In a field where there is less than a handful of us at a professional meeting or networking event, ColorComm provides this unique opportunity to learn from executives and household names within our field. ColorComm provides our members with more than just programs. We counsel our members on employment opportunities, recommend each other for speaking opportunities, share/trade information and resources and help our members get nominated for industry awards. We also work to bring more brand visibility to our members and promote their accomplishments. ColorComm is also for women who’ve achieved great success and are looking for new opportunities to connect and gain a fresh perspective on their career. The organization focuses on connecting professionally and personally. For example, last Fall, Board Member Marcia Dyson (Spiritual Leader and wife of Michael Eric Dyson) hosted us in her lovely home for a Member’s Only Tea to discuss connecting women globally. How often do you get invited to dine at one of the nation’s thought leaders homes? The experience was exquisite. Marcia pulled out all the stops and it felt like we were at the Four Seasons. H+S: What inspired you to launch ColorComm? When did you officially launch? LWW:ColorComm began as an invite-only luncheon series in May 2011 and launched membership in July 2012. ColorComm was launched out of a need to see more faces like myself in the communications industry. Not only faces, but executives that I could learn from and model my career after. This field is very political and often cut-throat. I’ve learned that in order to survive (which I am for now), you need a support system. You cannot possibly navigate your clients, managers, or subordinates without having guidance. ColorComm offers the opportunity to build relationships in an organic way with women at all levels. Executives actually come out to our events and programs, which I find unique in comparison to other professional organizations that I’m affiliated with. [Before launching ColorComm], I was working at Hill & Knowlton in Washington, DC [and didn’t see] one woman of color at the VP level or above out of more than 50 employees. I wondered where are we? We must exist. H+S: What is the mission for this organization? LWW: The ColorComm mission is to personally connect women with other like-minded individuals to build a strong network of leaders by creating mentors/mentees, business relationships and friendships. ColorComm offers a unique opportunity for women to share experiences and learn from one another to enhance their personal and professional development. H+S: You mentioned that you recently transitioned from a luncheon series to more of a trade organization. How many members do you have now? LWW: We are approaching our one year mark as a [trade organization] and have 100 + members in DC, 30 + members in Chicago, and we will be launching membership in New York in August. We are excited about this growth and understand that dues aren’t cheap. They are $360 for the first year ($150 initiation fee + $210/year). It’s an investment in your professional and personal development. I can’t tell you how many stories I’ve heard about how ColorComm has helped to enhance a member’s career. Women have gotten jobs, formed new business relationships, have been able to switch careers, and have found mentors and sponsors within this organization. H+S: How is the organization structured? Do you have employees or is it just your executive board? How many people are you working with? LWW: ColorComm is structured with 17 Board of Advisors from DC and Chicago. Each city has an Executive Director, Communications Director, Programs Chair, Membership Chair, and Sponsorship Chair. All of the roles are filled with volunteers, except for our Executive Director, who receives a small stipend. The Board and the ColorComm leadership team are all paying members of the organization. H+S: How did you fund the initial launch of ColorComm? Sponsors? Investors? LWW: ColorComm was funded by my own personal investment and two other investors, who have begged to remain nameless. H+S: Over the last few years other organizations and media outlets that are similar to ColorComm have popped up to help ‘working girls’ navigate the different stages of their career (ex: Levo League, Daily Muse, The Grindstone, etc). Did you notice this when you were thinking about launching ColorComm? What do you think of the emergence of these resources? Does it further validate or underscore why ColorComm is necessary? LWW: These organizations are fantastic and they all specialize in different things. ColorComm is a traditional professional organization that focuses on building relationships in-person. When I started ColorComm, I had blinders on. I didn’t research every organization that was out there. I drew from my own personal experiences and developed a group that would yield mutually beneficial relationships. After all, that’s what networking is truly about. H+S: What has been the biggest obstacle you’ve faced so far in the process of turning ColorComm into the next great trade org for women of color that work in the communications industry? LWW: One of the biggest challenges is that some people don’t understand what ColorComm is. There are quite a few [people] who want to lump us in with other organizations. However, there are so many moving parts to our organization and I feel that we can do a better job at communicating all our offerings. [For example], I was having a conversation with one of our huge New York supporters and I was sharing more information about the direction of ColorComm in New York. She informed me that she didn’t know we had some big corporate sponsors (Weber Shandwick, Golin Harris, Flowers Communications and PRWeek) who’ve partnered with us for the year. I immediately thought, how do you not know that? You’ve been with ColorComm since the beginning and you read all of our communication pieces. Based off that conversation, we created an infographic of our sponsors and Board Members that was distributed to more than 3,000 communications professionals. H+S: What’s been the biggest surprise? LWW: I’ve witnessed a lot and one thing that has surprised me the most is how women in their late 20s or 30s are not as accessible or agreeable towards participating in programs as compared to the executives in their 40s or 50s that I’ve interacted with. It’s quite shocking! I can get a response back from the EVP at BET Networks or the Editor-in-Chief of EBONY, but several women in their late 20s or 30s have given me so much grief and so much runaround. They are by far the most difficult to work with. H+S: Why do you think this is the case? What can we do as young professionals (and women) to work through some of these issues? And lastly, [many of us] are building a career and can only see what is in front of us. We aren’t looking at the long term gain or how aligning with a particular organization may expose us to key people or potential business contacts. LWW: My mother is someone who inspires me and pushes me the most. She was President and CEO of an advertising firm called WilsonSculley, which as headquartered in St. Louis and had offices in Chicago. She’s familiar with my world of communications and I’m learning about her world of advertising. Every time I feel like I’m burnt out or feel like giving up, she reminds me why I started this in first place. My mother is a huge inspiration in my life along with ColorComm’s supportive and generous Board. I have relationships with each and every one of them, who continue to push me to my best and offer feedback around the clock. H+S: Speaking of your support system, do you have any mentors in the industry? If so, what impact has their presence had on your career? LWW: Traci Otey Blunt, SVP, The RLJ Companies (founded by Bob Johnson founder of BET Networks) is someone that I look up to and admire. She’s an amazing woman with a similar career path that I can draw upon. She’s worked in the PR agency world, worked on Hilary Clinton’s campaign (I worked on Obama’s), and overall just gives honest and strategic advice. I also consider Board Member Marcia Dyson and Digital Expert Shonali Burke to be great mentors and resources. H+S: What’s the best and worst business advice you’ve ever received? LWW: Give 110 percent in everything that you do and treat every day like an interview. My Dad reminds me of this on a daily basis. And I don’t remember any bad advice because I tend to block negative things out. H+S: What is one big goal you hope to accomplish in 2013? LWW: To get my social life back. I’m not sure where it went. I have a full time job as a Communications Strategist at a PR agency and I run ColorComm. My Blackberry goes off all day, every day. I manage client work, manage a staff through my job + ColorCom member issues/concerns, programs and events, a leadership team in DC and in Chicago, questions from potential members, requests for coffee meetings, the list goes on. Every single day I receive an email regarding one of these things- even on the 4th of July! H+S: That’s a goal I think we can all get behind. Any last words? LWW: Yes. I want to encourage more people of color to reach out and support one another. So often we are in competition mode with our peers and colleagues. We need to rely on each other for support and figure out how we can build each other up instead of bring each other down. To learn more about ColorComm visit them online at www.colorcommnetwork.com and on twitter at @ColorCommNtwk, @LWesleyWilson.